For the trim pieces we used primed pine boards. We chose to do this because the boards were not terribly expensive (probably about $20 per door in wood) and they were already primed. If you wanted to save money you could always use a MDF 4’x8′ sheet of MDF and have it cut in strips. 1. 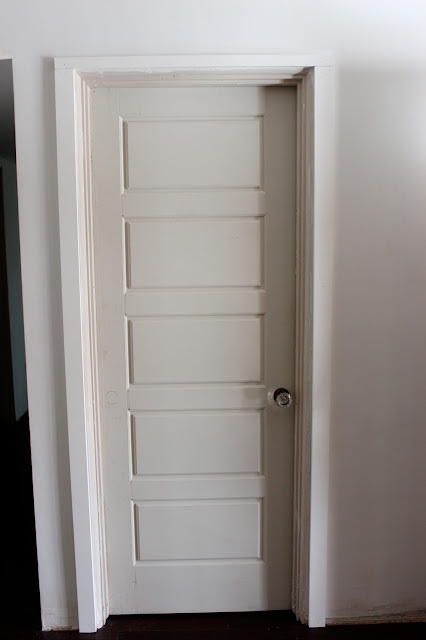 Cut a 1″x2″ to the width of your door frame plus your side trims (Piece #1). 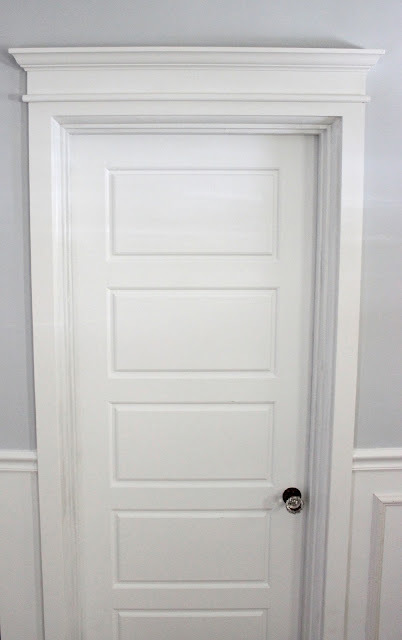 For example our door frame was 32 1/4″ wide plus 5″ for the 2 1″x3″ side pieces (remember the 1″x3″ are actually only 2.5″ wide and not 3″). 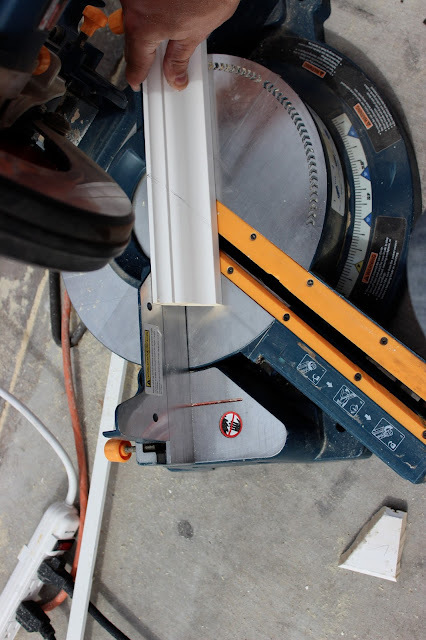 We then cut the board to 37 1/4″, leveled it above the frame, glued and nailed it with the finish nailer. 2. Next its time to install the side 1″ x 3″s. (Piece #2 and #3) These are simple, just cut to size (measure from the ground to the bottom of the trim piece you installed in step 1). 3. For this next step you take a 1″ x 2″ cut it to size. You want to have this piece extend 1/2″ over each of the side pieces so it needs to be 1″ longer than your previous 1″ x 2″. Next you need to shave it down to 1 1/4″. 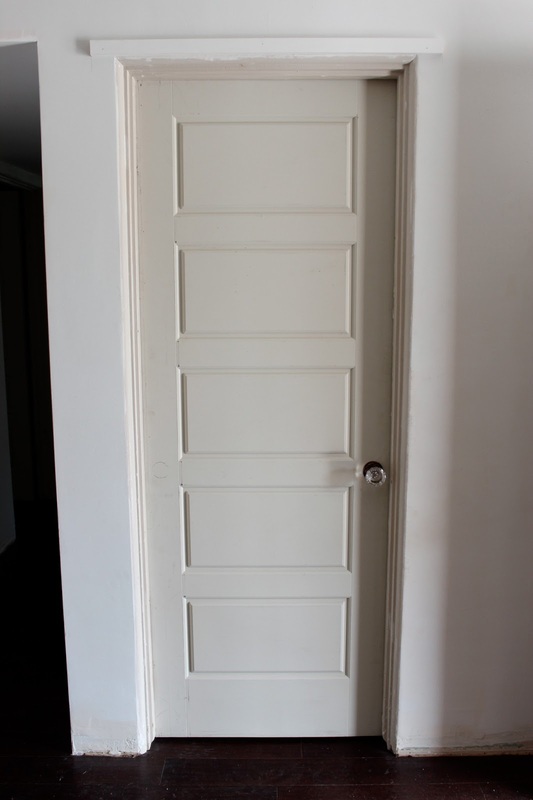 This step isn’t totally necessary but we didn’t want it to protrude too much so it was worth shaving a 1/4″ off. 4. Take the board you just trimmed and run it through your router. We used a 1/2″ bit that rounded corners. Round the top and bottom of the front and both sides (We used the side of the board that we did not cut as the front). 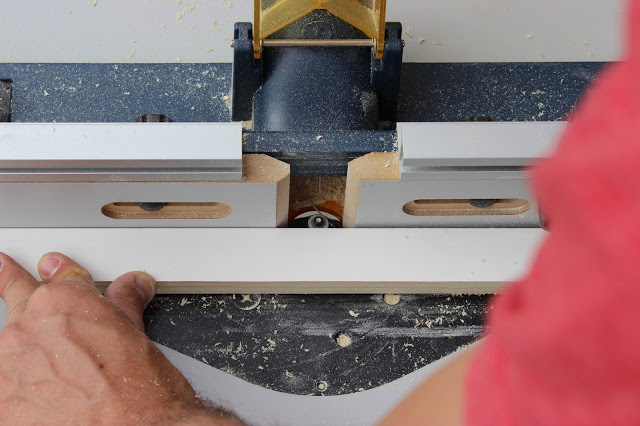 If you don’t have a router you could always use a orbital sander but it will definitely take a lot longer and wont be as exact. Mark the hangover 1/2″ on each end. 5. 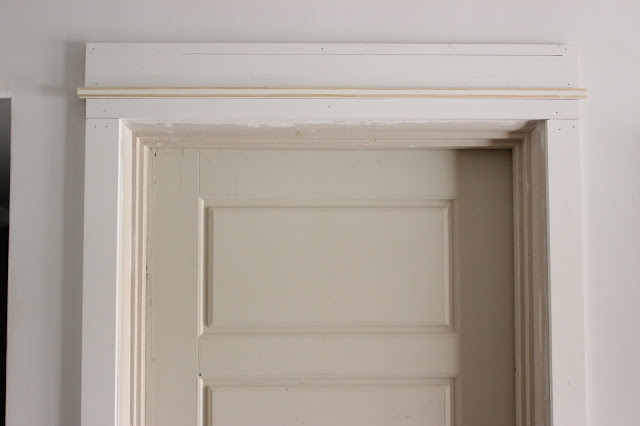 Lay the trimmed board (#4) perpendicular to your top trim piece (#1) It should protrude out approximately 1/2″ in front and on each side. 6. 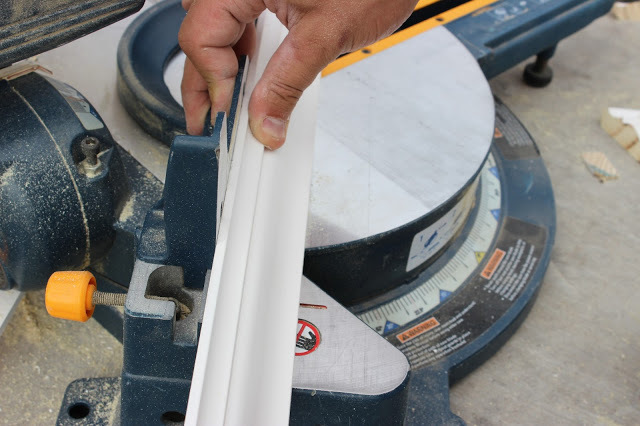 Next you trim a 1″ x 4″ (Piece #5) to the same length as Piece #1. Make a mark 1″ down from the top of the board using a triangle. This will be used for installing the trim. Install it directly above Piece #4. 7. The trickiest part of this is cutting the crown pieces for the top. 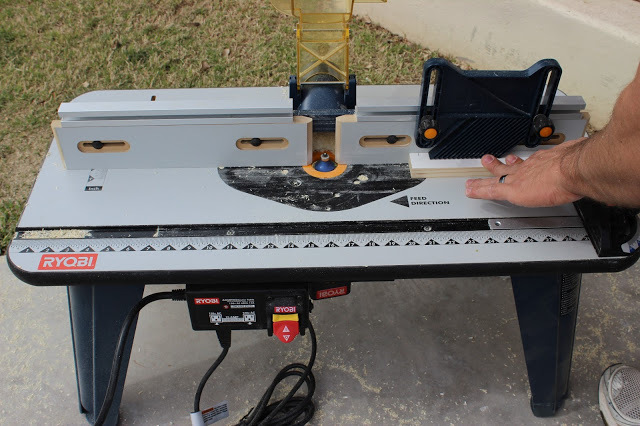 There are plenty of you tube videos that show you how to cut outside corners but we have some photos that may help. One trick J does is he always marks the angle he needs with a pencil, he says it helps him visualize the cut. So to do this you can hold the trim piece up on the wall and mark it. 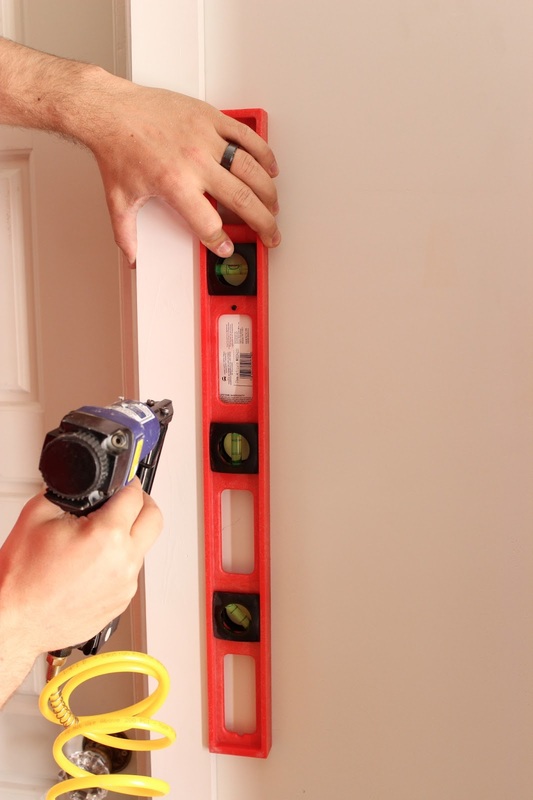 Test the fit before you install. 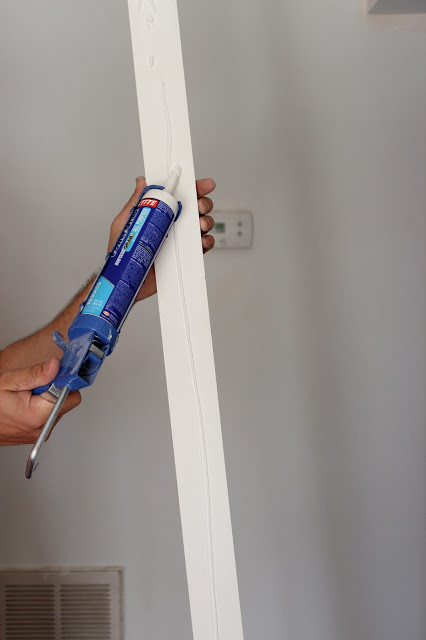 You can also glue one corner before you nail it up (this saves some time and ensures at least one corner will be perfect) :). Once the crown pieces are cut, install the Piece #6 and then fit #7 & #8 into place. You will want to put some glue on the corners to help create a strong bond. What little things like this in your home are things that you are just driven crazy by, knowing that other states have that all over? Wrap around front porches, yea- totally dreamy, and totally not in Phoenix. Brick laden streets? For sure not here- but I don’t even know where? Looks great! 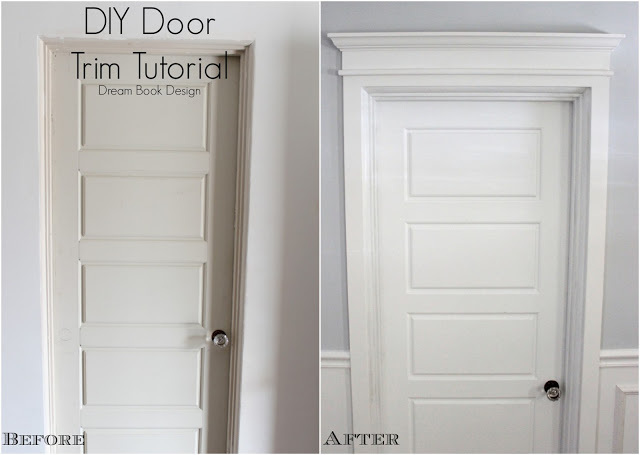 There is also a tutorial over on the blog, Sawdust Girl, http://sawdustgirl.com/2013/06/10/layered-door-and-window-trim-molding that might be of interest. She does kind of the same thing. you guys are so good at this stuff! This blows my mind! We are house-hunting and since most homes with this kind of trim are not affordable, will be doing some of these types of things ourselves – thank you!! Very nice trim. I just built a lot of trim like that. 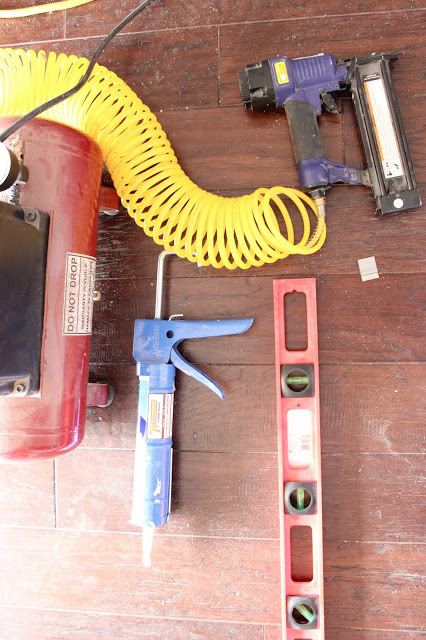 A suggestion for you is to assemble that header on the bench. Once it is all put together, nail it up in one peice. I LOVE this! This is exactly what I was looking for! Great post and so helpful. I’m a sucker for all things with southern charm. These door frames completely capture it! Thank you for sharing! Hi. What is the paint color on your wall? The color is Sherwin Williams Olympus White!